In this episode we talk all about Google Analytics for your veterinary practice. Everything from how to install it to what data you should be looking at, how often and how to look at it. Measuring your marketing is one of the most important things you can do and I would go so far as to say that if you can’t measure your marketing you’re just guessing and that it probably. Without proper measurement, your marketing is just guessing, and not even educated guessing. The truth is, that most marketing results in failure (leasons) and because of this, when you end up with a winner, you’ll want to know it! I’ll also be showing you how to automate this as much as possible so that you don’t have to think about it. One of the things Google Analytics does really well is it shows you if there are any serious problems or opportunities that you wouldn’t have know about otherwise. You’ll also be able to see if certain types of traffic are doing better than others, like mobile vs tablet vs desk top or if social media traffic converts better than SEO Traffic. I also talk about how automate Analytics report by email so that you don’t have to spend time constantly logging in to check. The first step to using Google Analytics is installing it! Go to SnoutSchool.com/Brandon to get her list of 5 must-have social media tools now. You’ll learn to create professional-looking social media graphics, save time by scheduling posts and find out where your clients spend time online. Not only that, but she’s got great tips for getting your whole veterinary team to understand the importance of social media. 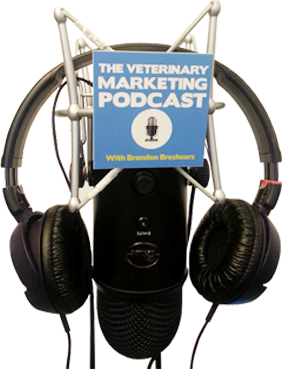 © 2016 The Veterinary Marketing Podcast. All rights reserved.